DVIGear launched the next generation of its DisplayNet family of products at ISE, stand 1-F70. DisplayNet employs SDVoE technology, the most widely adopted networked AV standard worldwide, to transport uncompressed AV signals over 10GbE Ethernet networks. DVIGear will also demonstrate a host of other AV signal distribution products at the show. The newest member of the DisplayNet family, the DN 200 Series expands the feature set of its predecessor by adding support for resolutions up to 4K60 (4:4:4) with 8-bit color, or 4K60 (4:2:0) with 10-bit color (HDR). Further, the DN-200 Series includes an HDMI 2.0 input that fully supports HDCP 2.2, plus a DisplayPort 1.2 input as well as support for High Speed USB 2.0 (480Mbps). A scaling engine has been added in both the transmitter and receiver units that enables MultiViewer applications and more robust video wall capabilities, as well as full seamless switching, regardless of input resolution. The DN-200 Series is available in two models that support either Cat-X twisted pair cables or signal distribution over fiber optic media using industry standard SFP+ optical modules. Both models will be available in Q2.2017. In addition, DisplayNet Manager Software has been rebuilt from the ground up to be a completely web-based client. The software communicates with the DisplayNet Server (DNS-200) via a built-in API, which then distributes commands to the DisplayNet devices on the network. This new architecture enhances user experience, flexibility, and allows new features to be rolled out much more rapidly in order to support customer needs. "Clearly, the pro AV industry is rapidly transitioning to AV-over-IP technology," said Steven Barlow, president of DVIGear. 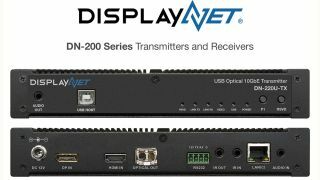 "With the introduction of the DN-200 Series hardware and software, our DisplayNet product line is continuing to lead this transition." In addition to DisplayNet, DVIGear is also exhibiting a host of other AV connectivity solutions. The new MultiPort 4K Fiber Optic Extenders (DVI-7340 / DVI-7341) are designed to meet and exceed even the most demanding system requirements. These extenders support multiple signals such as uncompressed HDMI or DVI, embedded audio, balanced or unbalanced external audio, bidirectional IR, RS-232, and Ethernet using a single fiber optic cable. They support HDMI with embedded audio as well as independently routed balanced audio signal extension. They extend HDMI v1.4 (HDCP compliant) signals at resolutions up to 3840x2160 at 30Hz (4:4:4) and 3840x2160 at 60Hz (4:2:0). Three EDID modes are provided: pass-through, learn, and factory default. The units support distances cable distances of up to 1,000 feet (300m) with or without HDCP. In applications where HDCP support is not needed, these extenders support optical links up to 1.2 miles (2km). The DVI-7340 and DVI-7341 are shipping now at $1,350 (USD) list price per set. The new 4K HDMI Fiber Optic Extender (DVI-7317) is a compact 4K Optical Extender that transmits high-resolution HDMI signals over extreme distances using a single fiber optic cable. It supports HDMI v1.4 (HDCP compliant) signals with resolutions up to 3840x2160 at 30Hz (4:4:4) and 3840x2160 at 60Hz (4:2:0) over cable distances of up to 1,000 feet (300m). The DVI-7317 is expected to begin shipping Q2.2017 at a list price of $698 (USD) per set. DVIGear has also added a new power distribution unit to its lineup. Both the new +5 VDC model (DVI-7525-PDU) and the existing +12 VDC model (DVI-7520-PDU) are engineered from the ground up for 24/7 mission-critical applications. These units offer improved reliability with an MTBF of greater than 220,000 hours. The units each have an overall power reserve of 200 watts as well as eight outputs. Each output is rated for 25 watts. These features allow system designers and facility managers to optimize power management through more efficient use of rack space, making them well suited for a wide range of professional applications. Both the DVI-7520-PDU and DVI-7525-PDU are shipping now at a list price of $450 (USD) each. The 4K MultiViewer Switcher/Scaler (DVI-3580a) is a solution for system designers and facility managers facing uncertain requirements from presenters that need AV signal distribution for a diverse range of source devices, resolutions, and signal formats. It accepts up to seven video inputs: four HDMI (or DVI), two DP, and one RGB/YPbPr Analog (VGA). It includes a scaling engine supporting input resolutions up to 4K60, user-selectable output resolutions up to 3840x2160 at 30Hz, as well as seamless switching. Two mirrored outputs are included: one HDMI and one HDBaseT (with POH). This MultiViewer can simultaneously display up to four video signals with resolutions up to 4K, which are displayed in seven possible layouts. Advanced audio capabilities are included such as audio embedding, de-embedded audio outputs, and lip-sync correction. The DVI-3580a may be controlled via LAN (built-in web GUI or Telnet), RS-232, IR remote, and the front panel. The DVI-3580a is shipping now at $2,195 (USD) list price.